Glorious weather sustained an ideal Autumn outing amidst old-growth trees, scenic ravines, and a sparkling waterfall. 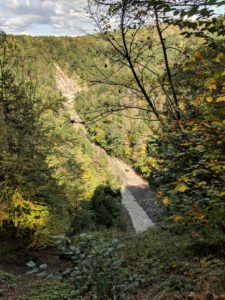 Our enthusiastic group of 11 hiked about 4 miles altogether, ascending the gorge rim to a lookout point exposing views of canyon walls and the South Branch of the Cattaraugus Creek below. We were treated to many large mature hemlock, tulip and maple trees, thanks to the dearth of logging in this area. This donated property is maintained by the Nature Conservancy, which is wholeheartedly committed to conservation, plant diversity and sustainability. 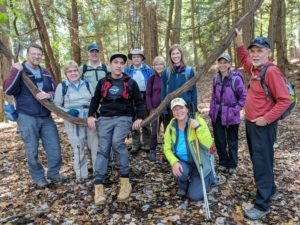 Efforts to invigorate the vanishing American Chestnut tree, a victim of blight, were inspired here and we found many spiny nut husks under a lone tree. We saw milkweed plants that attract and sustain Monarch butterflies. Our group identified a hickory nut tree, and butternut and black walnut varieties. 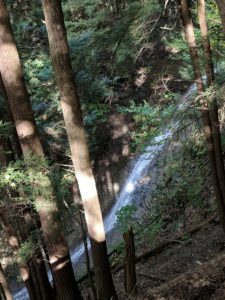 After descending to Deer Lick Creek and viewing the beginnings of a waterfall, we climbing out of the ravine, and descended a steep side trail for excellent views of Deer Lick Falls, its airborne spray sparkling in the sunlight. Following a steep ascent on the return trail, we paused for a fun swing on a strong old grapevine hanging down between two trees.